I often hear this question asked in conversation with newer gardeners, when the discussion moves to roses and how to care for them. So many other types of plants require little, if any, pruning and trimming, so why is it essential for roses? For starters, roses are not your typical plants. If left to their own devices, many types of roses will quickly fill out their space and start to become unruly. The whole reason we plant roses in the first place is to have them produce as many of the precious blooms as we can possibly get. Trimming roses serves to keep the plant healthy by removing dead and/or diseased canes, and it also serves to make the plant more healthy and efficient by removing the parts that are not doing well and encouraging the parts that are. 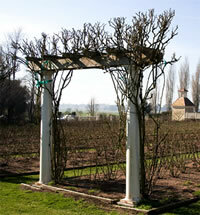 Pruning roses also serves to encourage new growth year after year. Roses that grow year after year unchecked, will often start to produce fewer and fewer blooms and the plant will eventually fall into a state of lackluster performance. 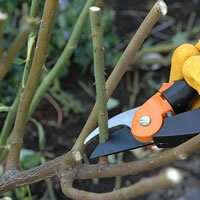 Pruning roses helps to keep them healthy and strong, season after season. I have found that many gardeners make the process of pruning far more complicated than it really needs to be. It is a rather simple process that you can do with a few basic hand tools, if that is all you have available. For most types of roses, you should have a good pair of hand shears available. Over the years I have learned the lesson of making sure you buy good equipment. Don't be afraid to buy yourself a decent pair of hand shears rather than going to the local dollar store. Sure the cheap pair will work for a period of time, but they will almost never last as long as a pair that you paid the premium for. The last thing you want to do is start trimming roses with an old, rusty pair of shears. These are something you are going to use for quite a few years so in my opinion, make the investment in a good tool that will last. For the larger jobs, you will also need a pair of lopping shears, to cut through the bigger canes, and you may even want to invest in a pair of electric hedge trimmers for those bush type roses. You should almost always plan to do your pruning in the early spring, after the worst of the cold weather has passed, but preferably before the leaves start to open. This makes it much easier to see what you are doing and get in to the harder to reach canes. Start by removing all the dead wood from the previous season, as well as any canes that look discolored and unhealthy. 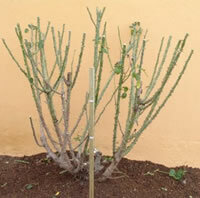 I will usually opt to remove unhealthy canes when possible and allow the plant to grow new fresh ones instead. The next step in trimming roses is to start pruning back any lateral canes that overlap or cross one another. When the leaves open up on these canes, they will eventually compete for sun light and this is no good. Prune them back so they all have equal exposure. The last step depends a lot on the types of roses you are growing. 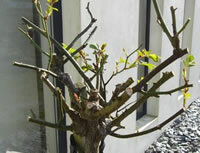 For climbing roses, you generally do little trimming to the main canes and you just shape them to the supports you have available. For bush roses and the like, you will want to cut back the main canes about one third of whatever their current height is. This will encourage the plant to start new growth. After you are done trimming roses, you should take the time to also rake up around the base of your roses and clean up any dead leaves and debris that may have blown in and collected around the canes. Never let this material lay around as it could become a breeding ground for pests and diseases. Throw away this material, along with your cuttings in the trash and never throw them into the compost pile as some spores can survive the cold winter months only to re-infect your plants the following spring. The last thing I always do after I'm done with my trimming is to give my roses a fresh layer of mulch to start off the new growing season.